Smartphone thumb is a popular term used to describe pain felt at the base of a person’s dominant thumb. The dominant thumb is the one they use to operate their smart cellular device. While updated with a moniker that reflects the technology du jour, this condition isn’t exactly new. In the 1980s, people worried children were all going to get “Nintendo thumb”. In the 1990s and early 2000s the term “Blackberry thumb” was thrown around. The cause of smartphone thumb is repetitive stress injury or RSI. RSI is a diagnosis of exclusion meaning doctors only reach it after ruling out several other, more serious options. If there is nothing broken or dislocated in the hand, a doctor will come to the conclusion that the pain results from slight inflammation due to repetitive motion. The repetitive yet limited motions the thumb makes while texting are abnormal motions, which can lead to pain. Eventually, more serious conditions including osteoarthritis and tendonitis can develop. 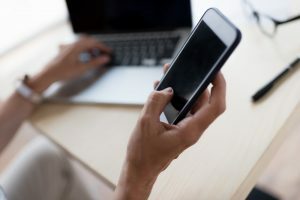 Using other fingers to operate the device, taking breaks from your phone, and stretching the area regularly can all help prevent the pain caused by smartphone thumb. Rest and mild pain relievers can help alleviate the discomfort for a time. However, these are not the only options available. If you find yourself regularly plagued with chronic joint pain due to smartphone overuse, Platelet Rich Plasma (PRP) injections are an affordable, in-office treatment that can help reduce discomfort for a prolonged amount of time. PRP injections involve taking blood from the patient and spinning a portion of it in a centrifuge to separate the platelets from red and white blood cells. The platelets are then combined with the rest of the blood to be injected into the affected area. In the case of smartphone thumb, that area is the joint at the base of the thumb. Some of the world’s top athletes have used PRP injections to treat issues including chronic tendon injuries, acute ligament and muscle injuries, knee arthritis, and fractures. Research backs PRP injections to treat issues such as Partial Ulnar Collateral Ligament Tears and knee osteoarthritis. Recovery from PRP injections is minimal. Patients are given a local anesthetic before injections. Depending on the pain levels, most do not need more than two injections total. The patient may feel some residual pain for a day or two. Once the stiffness and soreness diminish, they are left with improved joint function and reduced discomfort. Orthopedic surgeon Dr. Grossfeld is the Louisville authority on Platelet Rich Plasma injections. If you are interested in PRP injections as a way to reduce joint discomfort, contact her today. Call 502-212-2663 to make an appointment with an orthopedic surgeon who has been voted as one of the Top Ten Orthopedic Doctors in Louisville, KY and has received a Patient’s Choice Award as a top rated doctor from https://www.vitals.com/.